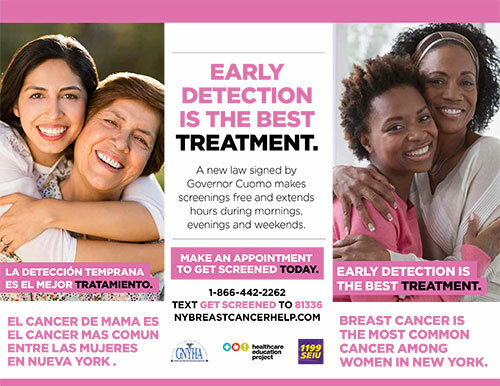 HEP launched a breast cancer awareness campaign around New York State to inform the public about the state’s free breast cancer screenings initiative and to drive calls to the state’s hotline. HEP continues to organize public breast cancer informational events along with free screenings. The Healthcare Education Project is a collaborative initiative of 1199SEIU United Healthcare Workers East and the Greater New York Hospital Association. Healthcare Education Project | Protecting access to healthcare in New York State.